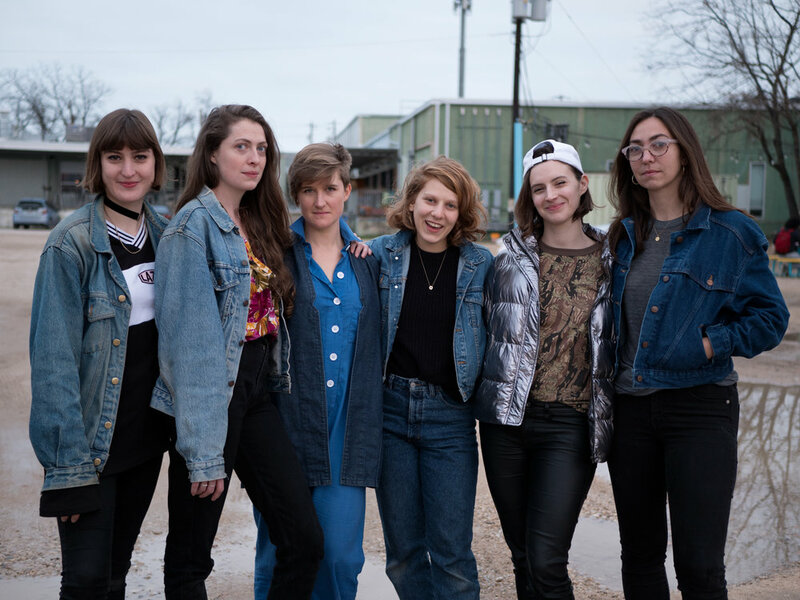 MATERIAL GIRLS is a nonlocal collective of six female-identifying artists formed in 2016. They have shown work nationally at the SPRING/BREAK BKLYN IMMERSIVE in New York, Sadie Halie Projects in Minneapolis, Trestle Projects in Brooklyn, and the Museum of Human Achievement in Austin, TX. Their work focuses on the power of objects and the negotiation between digital and physical space, as well as the facilitation of a supportive network for female-identified artists and thinkers. MATERIAL GIRLS core members are Cameron Coffman, Devra Freelander, Hilliary Gabryel, Claire Lachow, Gracelee Lawrence, and Rachael Starbuck. Hello MATERIAL GIRLS, thank you for having interview with De:Formal. First of all, can you let us know how was MG formed? MATERIAL GIRLS was formed in collective frustration at how underrepresented women still are in the arts, especially in sculpture and digital practices. We all met through an overlapping network of academia and residency programs, being drawn to each other basically because of art crushes. What is it like to have a seamless collaborative presence but also each maintain a singular rigorous studio practice of your own? While each core member of the group maintains a singular studio practice of their own, we are all constantly bouncing off of each other’s work and thoughts in our planning and communications for MATERIAL GIRLS. It all loops in on itself: the individual practices feed the collaborative work and vice versa. Many of our personal practices have expanded to include new mediums - for example installation and sound works - as a result of the collective confidence and knowledge of our group, and we have been able to accomplish much more ambitious projects collaboratively by combining our individual skills. We each have pretty distinct art practice superpowers that mesh really well together- it’s exciting! Are there any common themes or shared aesthetic behind each of your personal works? When we were making a zine for our first show, we shared a bunch of images and writings with each other in a Google Doc. We were delighted when we discovered that water, in many different manifestations, was a conceptual and visual motif that ran through many of our thoughts: the formlessness of water, water as a metaphor for empathy, water/wetness as desire, reappropriating/rethinking the notion of water being coded as historically “female”, the language around water’s phase changes representing emotional states, etc. It all relates to our common interests in playing with/pushing against boundaries, negotiating what it means to move through space as a female identifying body, and the fluid relationship between digital & physical touch. We’ve tapped into many of these themes in our collective projects, as they accurately characterize the dynamic nature of our non-hierarchical, non-local collective. Have you run into any challenges being a nonlocal collective? How do you resolve them? Our distance has been an incredibly important part of our evolution and has played a key role in the development of our collective work. While there are certainly challenges that arise, we work around them with our constantly bubbling text thread, group emails, and virtual meetings. We have been nonlocal since the beginning, so we began with the expectation of the digital being our primary means of communication. It has evolved into an incredibly important method and subject of our work. The video SAME shown at xoxo at the Museum of Human Achievement in Austin, TX drew from the responsive video thread between all of the artists in the show. While we had been image/video sharing between the six of us for some time, SAME also included the six invited artists and focused the project. The resulting video is a hypnotic love letter to touch and material, as well as a veiled peek into each of our lives. Do you plan to invite more artists into the collective in the near future? If so, what is the process like? We are committed to supporting and creating a platform for female-identifying and femme artists, and have made significant efforts in reaching out to artists outside of our core group for different projects. We’ve also talked a lot about inviting new members to the core group. Since MATERIAL GIRLS formed almost organically out of a network of pre-existing friendships a little over a year ago, we have yet to develop a methodology around how we’d invite new people in. However we recognize there are important voices that are currently missing from our core group, in part because we are all white cis women. It is a priority for us to broaden our collective work by introducing new perspectives in the not-so-distant future. Is there any advice you would give to emerging artists that would like to start a new collective? Creating a network of support is incredibly important, especially early in one’s career. Having a specific point of focus has allowed our collaborative work to take many new and unexpected forms. Sometimes, setting parameters for yourself can give you greater freedom.